A few hours later we arrived in Gaia, a short-over-the-bridge walk away from Porto, where all the river cruise vessels tie up. 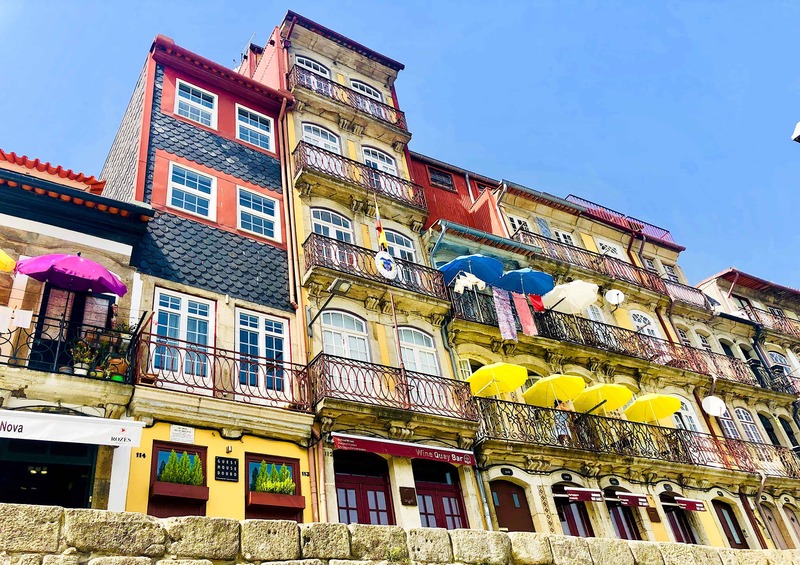 Being on this side of the tracks meant that not only were we afforded stellar Porto city views, but we were also surrounded by famed port cellars such as Graham’s, Dow’s, and Taylor’s. 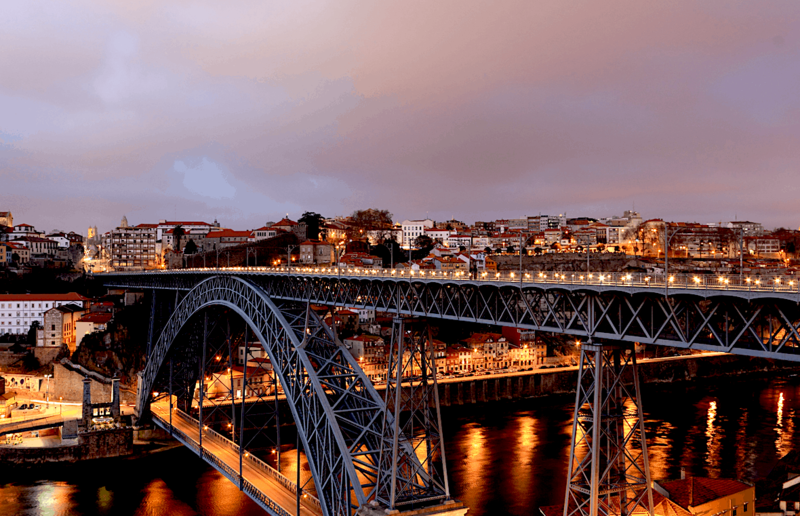 Look how pretty Porto is at night! Porto at night is stunning! 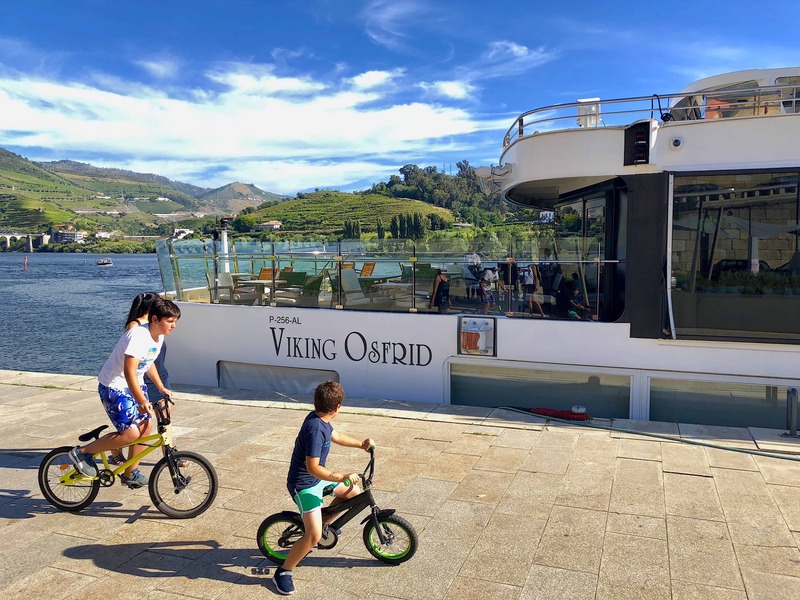 While I liked Lisbon, Porto was love at first sight, particularly after spying the small but proud, Viking Osfrid ship that awaited us. Unlike Viking’s European Longships, the new Osfrid is what I would describe as a shorty-long ship! 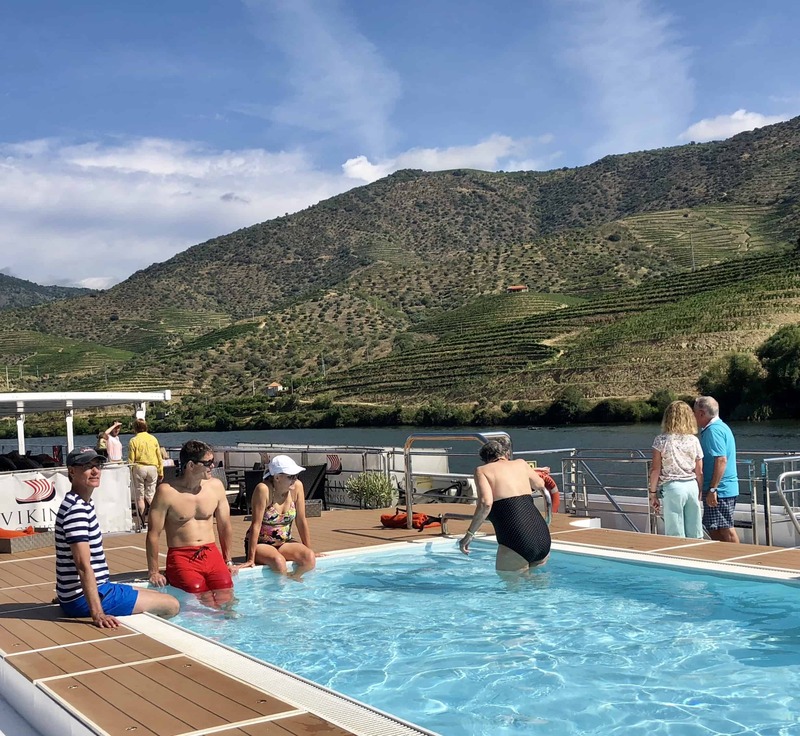 The reason for this petite adaptation is because the Douro River is narrower and shallower than other European waterways plus there are five extremely tight locks that our skilled captain needed to navigate with only inches to spare. 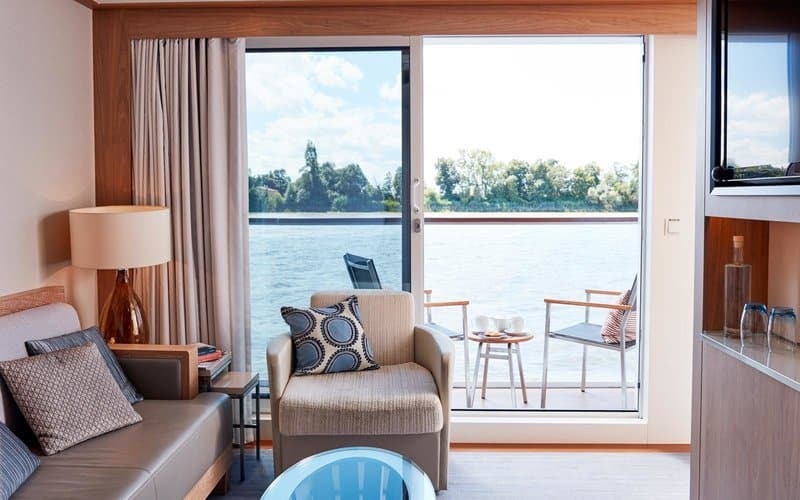 The Osfrid, a pert, lil’ Scandinavian darling, has all the amenities one finds on Viking’s bigger ships, but with a more intimate feel since it accommodates only 106 passengers instead of the usual 190. Surprisingly, this was the first Viking ship I’ve been on that had a swimming pool, which proved to be a popular afternoon hangout. My serene 185 sq. ft. stateroom was impeccably designed with a spacious, well-thought-out closet, lots of shelving, numerous mirrors, a 40-inch flat-panel TV with an excellent selection of On-Demand movies, a generous amount of electrical outlets, both 220V and 110V and a step-out balcony with seating. The bathroom shower had better water pressure than I have at home, with enough shelves for all my toiletries and an excellent hairdryer. 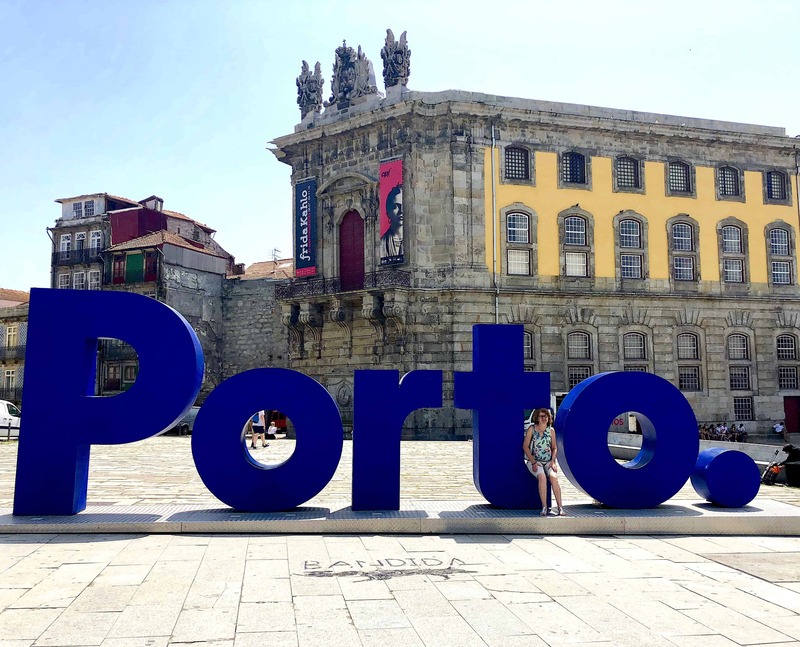 I couldn’t wait to unpack so I could get out and explore the streets of Porto, a grandiose medieval conglomeration of baroque and neoclassical architectural styles. It is often called the “City of Bridges” since there are six of them crossing the river, including a very cool iron one designed by Gustave Eiffel, a warm-up before he built the Eiffel Tower! Yes, you SHOULD try this at home! 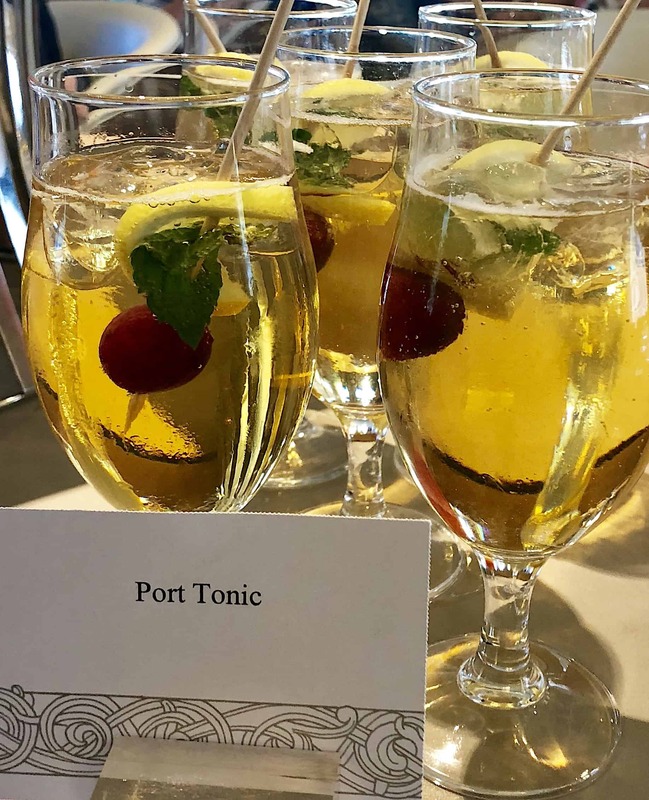 But first there was a rollicking fun, meet & greet the Viking crew cocktail party where I was also introduced to my drink of choice for the rest of the week- a refreshing Porto Tonico, made with 1 part white port to 2 parts tonic water, served over ice with a lemon twist. I loved the whole crew, particularly our hysterically funny captain, Antonio Coutinho, who was celebrating his 27th birthday that day. He is Viking’s youngest captain but had been sailing the high seas with his father since he was twelve. Other special members include Alvaro Martin, the Hotel Manager, who, like a magic genie, took care of my every esoteric request with never-failing patience, Matthew Eberle, our adorable, high-energy, hugely entertaining Program Director who captivated me with the epic story of Portugal’s history, and my favorite server, Nicolay, who took such good care of me. This was one of the best, most thoughtful Viking teams ever, although I think I say that every time I cruise with them. 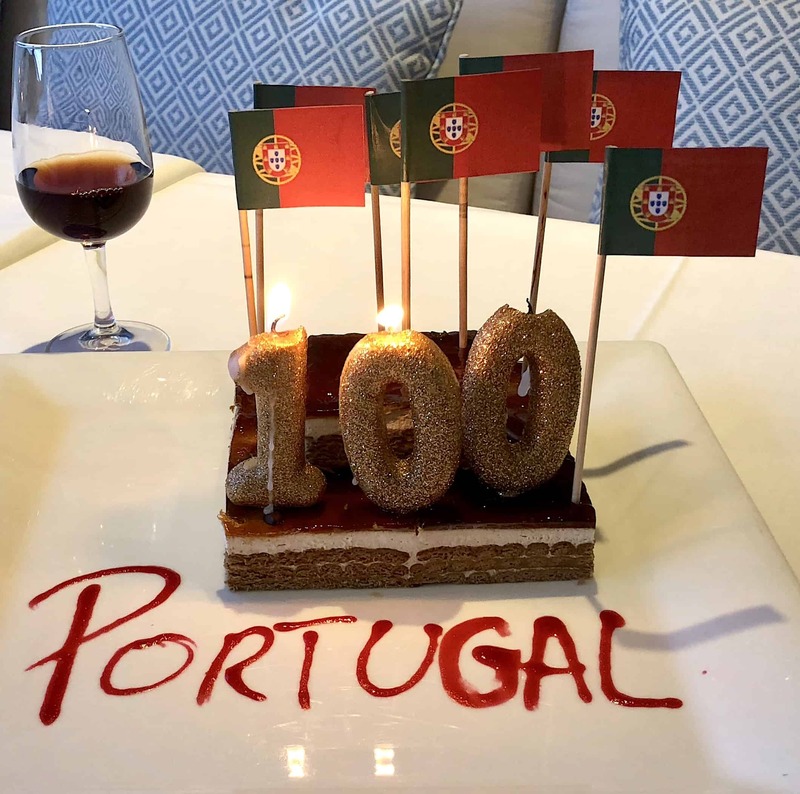 When they found out that it was my 100th country, they surprised me with a decorated cake paired with some 40 yr. old tawny… a girl could easily get used to this kind of attention. But I digress-so back to our first night on board, where I first tasted Chef Daniel’s delicious food. Every night there was a three-course Regional Specialty Tasting Menu or two other international choices including vegetarian options. 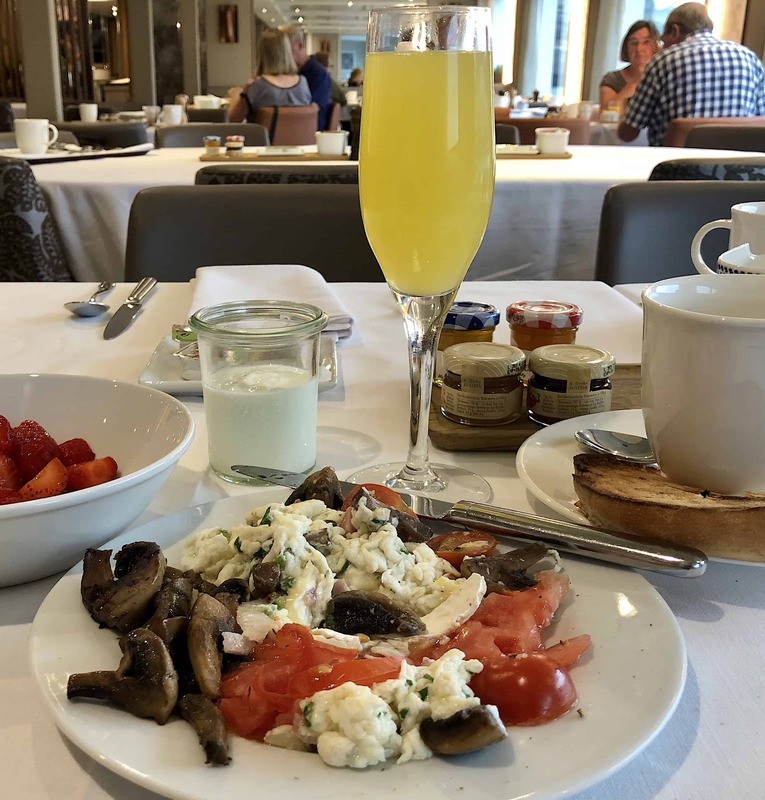 If for some reason none of those tickle your taste buds, you could move over to the always-available classic side of the menu for grilled salmon, charbroiled New York-cut steak, cheese plate, Caesar salad, etc. 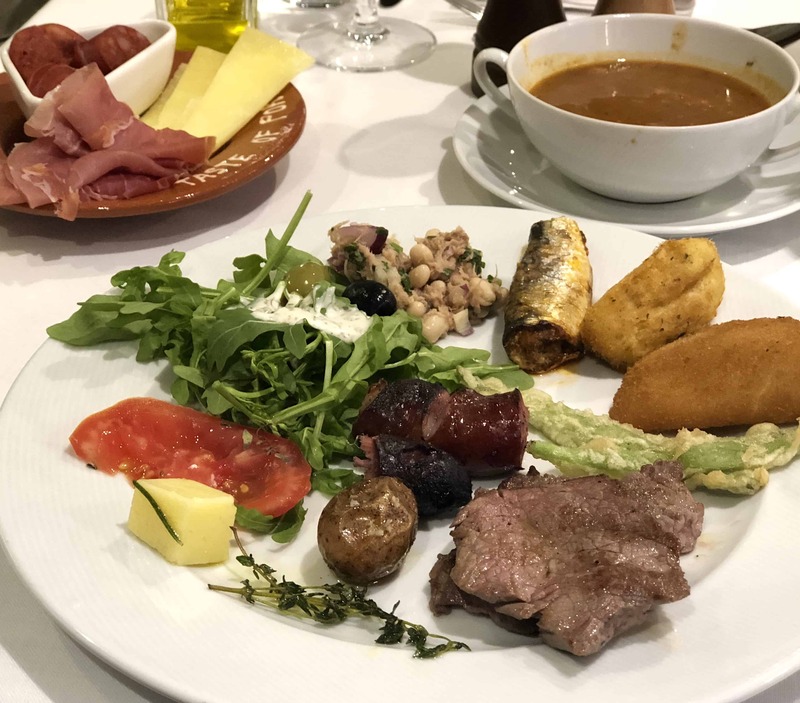 I generally opted for the Portuguese regional dishes, which the first night included grilled sardines, Caraplana- a fresh seafood stew, and a rich coconut-pineapple cake for dessert accompanied by a few glasses of a delightful Vinho Verde. As tasty as my dinner was, it was almost surpassed by the ambiance, since Capt. Antonio decided to take the Osfrid for a magical cruise around Porto, where we were surrounded on both sides by romantic, twinkling lights. 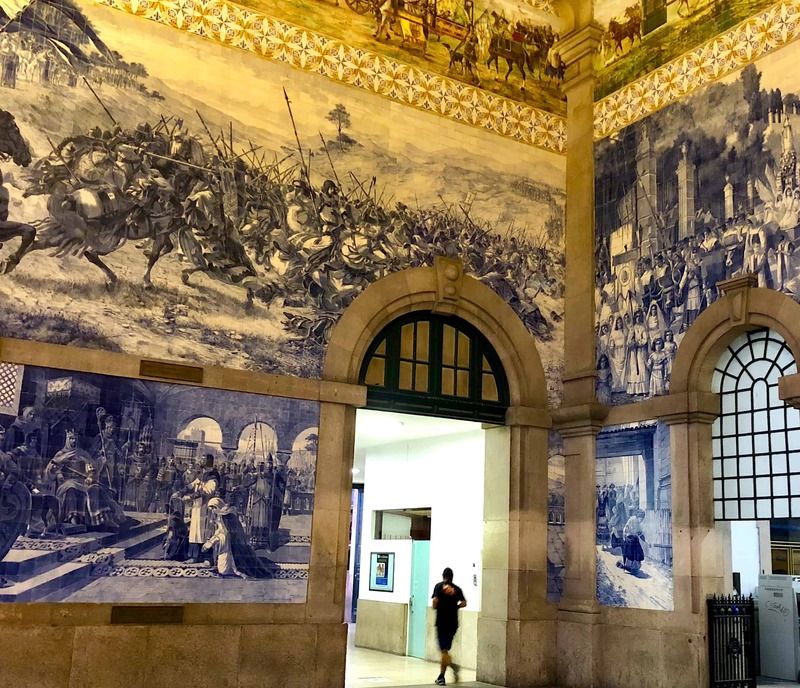 The next morning we set off for an introductory walk around Porto, stopping at Porto Cathedral, one of Portugal’s most important Roman Catholic monuments and the amazing São Bento railway station where the walls are adorned with 20,000 azulejo tiles depicting Portugal’s history. Time out for some shopping before rejoining the group for a tasting tour at Sandeman’s port wine cellar led by a guide dressed in the Zorro-esque black cape and wide-brimmed hat as seen on their logo. Thankfully I picked up some basic knowledge on the making of this fortified wine so as not to embarrass myself at the optional, Graham’s Port Dinner that evening. 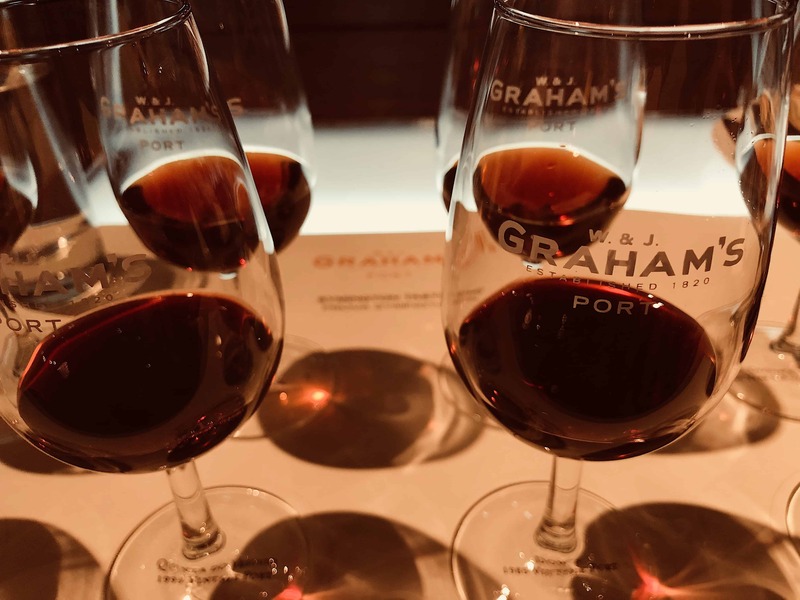 It’s pricey but how often do you get the chance to have a private tour of W & J Graham’s, a family-owned company renowned for producing the finest Port wines for almost 200 years. During our tour of the humongous cellars, I spied a barrel of vintage port dated 1868! After our guided tasting of eight ports, we voted the 40-year-old-tawny was the evening’s favorite. 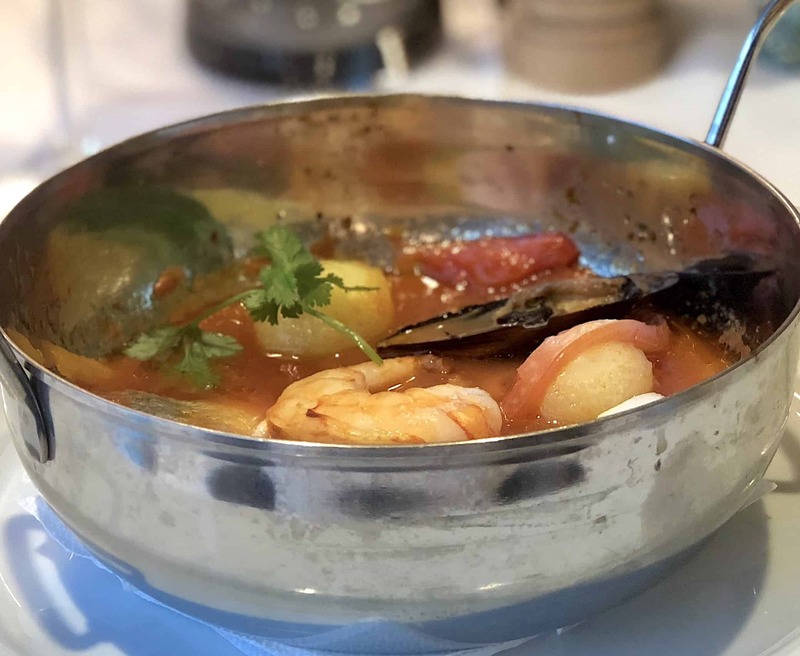 A traditional Portuguese dinner, paired with more incredible wines followed in a cozy private room at their award-winning restaurant. 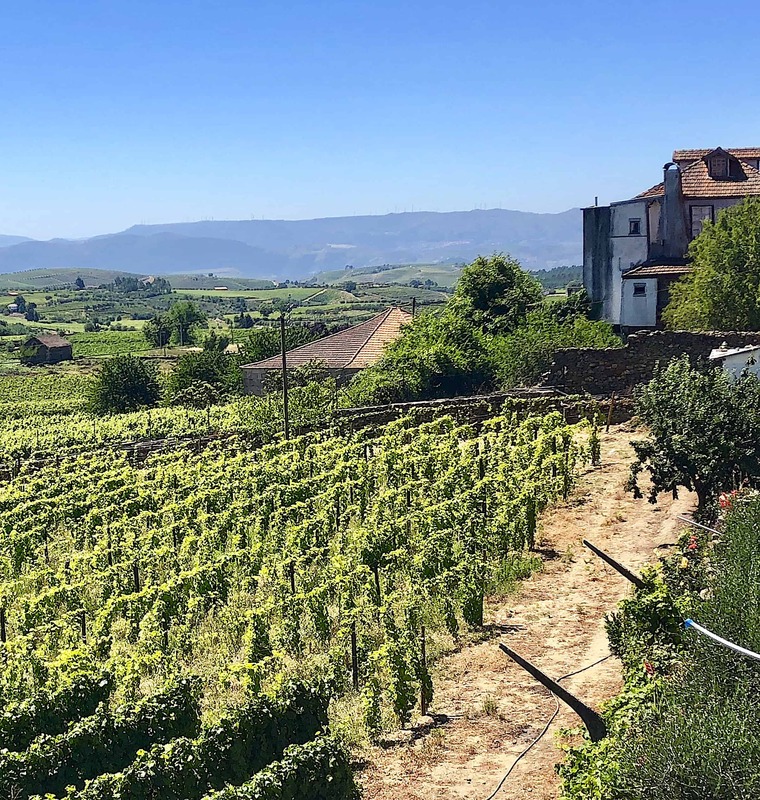 We woke up the next morning at Regua, the heart of the Douro port wine region. 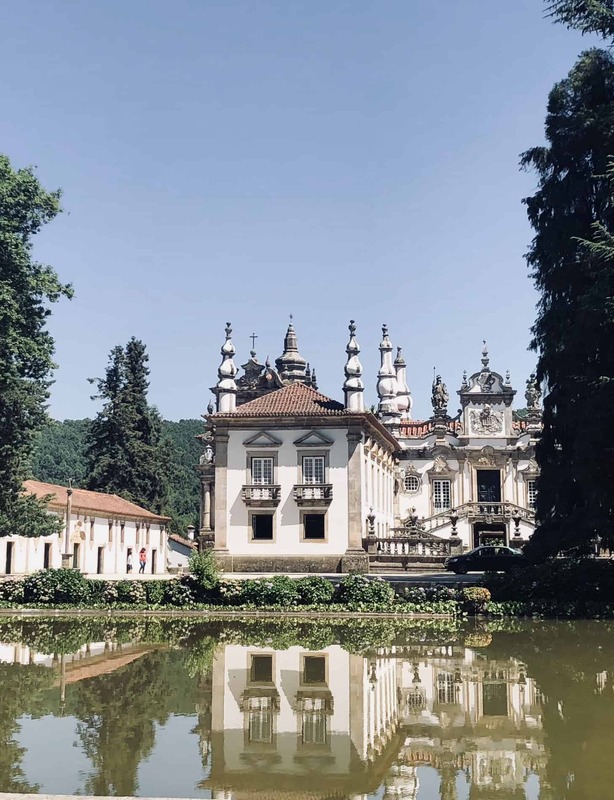 As we drove onto the grounds of the ornate 18th century Mateus Palace one guest whipped out his phone, looked at a picture and said “Yup, just like on the bottle!” and damned if he wasn’t right. 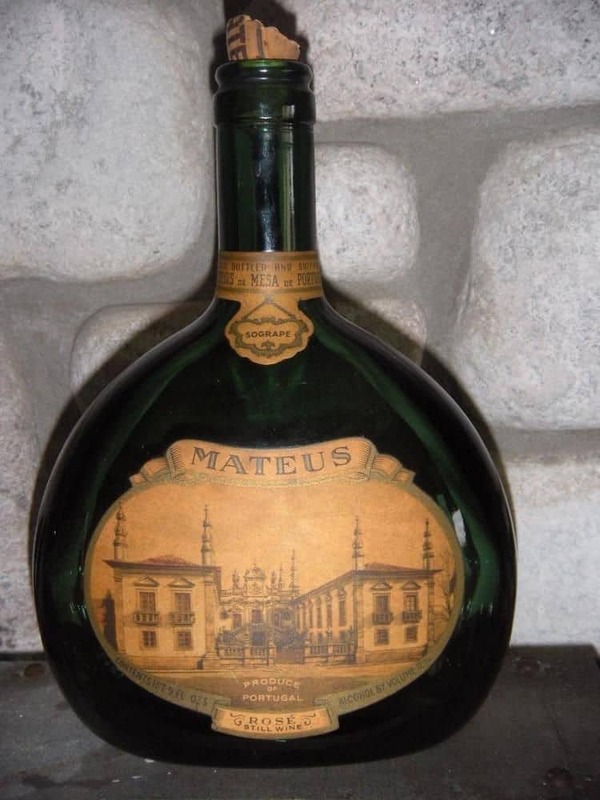 The picture of this ornate baroque palace has been on the front of the Mateus Rosé flask-shaped bottle for ages. Since descendants of the family of Count Vila Real still live there, we weren’t allowed to take photos inside the richly appointed, antiqued-filled palace. Time for a quick stroll through the expansive formal gardens, filled with formal flowerbeds, and a lane of cedar trees leading to a lake before taking off for another port tasting (which never grew old!). 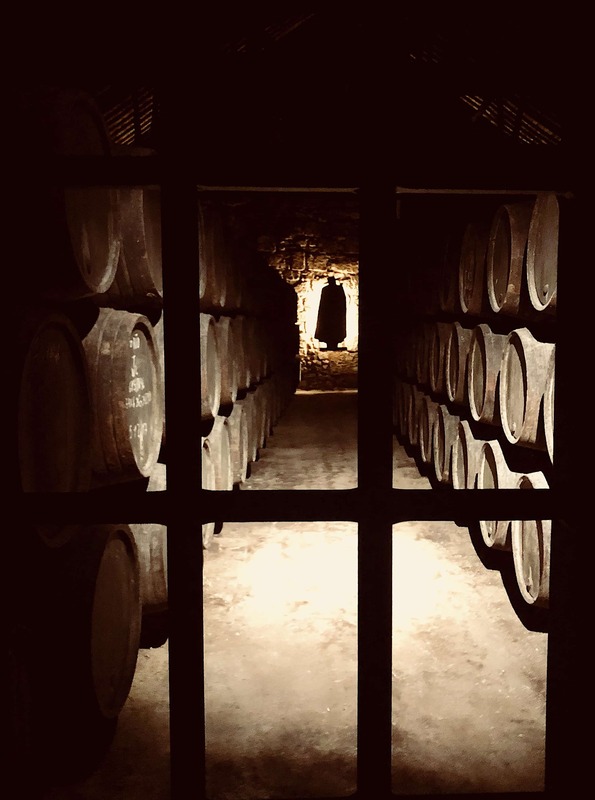 This one was at Sandeman’s Quinta do Seixo winery where we were seduced not only by the luscious Founder’s Reserve Port but also by the views of the 100-year-old vines gracing the Douro landscape. 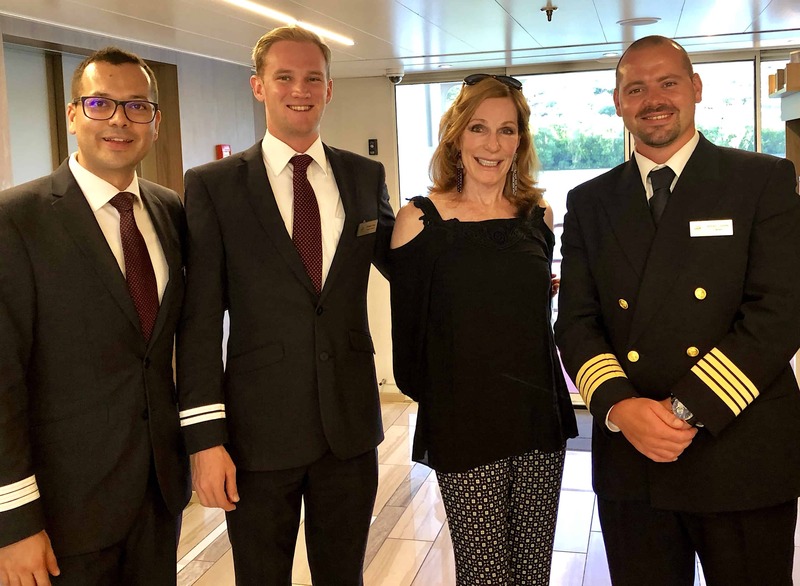 Back on board, it was party time for a special “Taste of Portugal” buffet dinner, which I was thrilled about because it included many of the Portuguese dishes I had on my foodie bucket list. The staff dressed up in traditional costumes and there were two local musicians from town serenading us on concertinas, an accordion-like instrument (but a much prettier sound) popular in northern Portugal. The last Portuguese village on the Douro, Barca d’Alva, is almost within spitting distance of Spain. 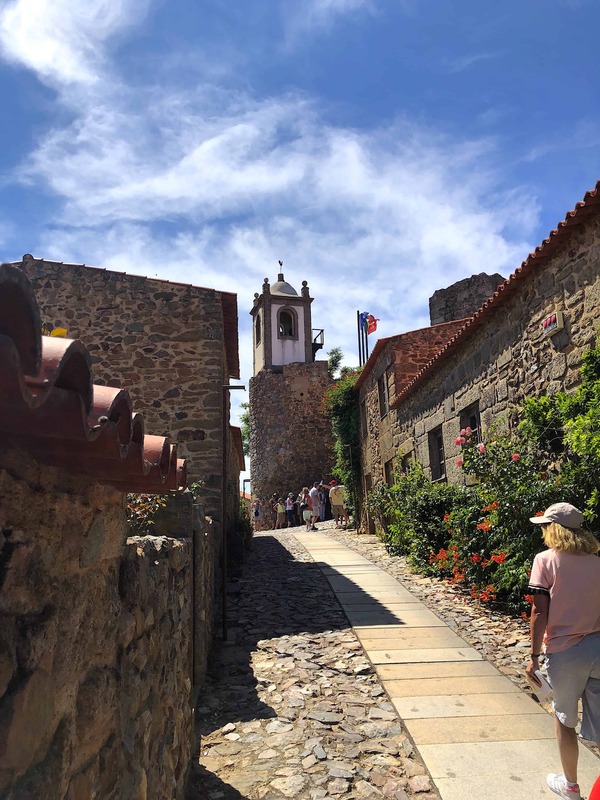 Today’s excursion included a visit to the charming walled village of Castelo Rodrigo, which was first inhabited in 500 B.C. 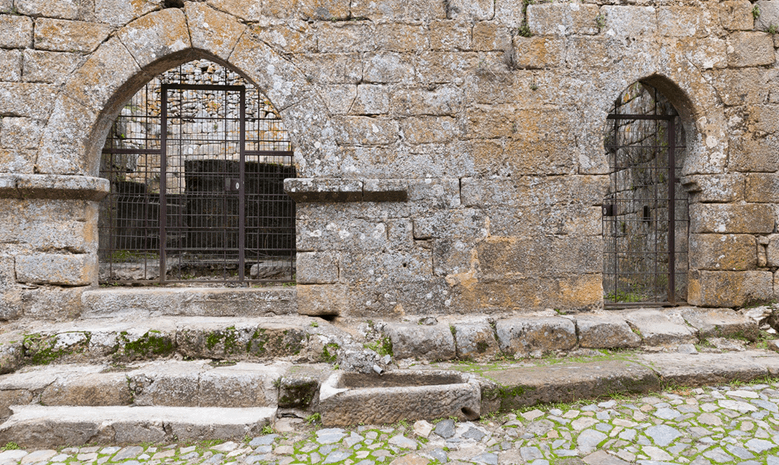 Home to about 60 people, the tiny hamlet is lined with steep cobblestone streets, an ancient fortress, medieval church, and an abundance of almond trees. Pop into one of the gift shops selling every conceivable almond delicacy-from chocolate and lavender-flavored nuts to almond sparkling wine. You’ll also find every guise of Portuguese cork on sale here even to lightweight cork clothing! Inside Tip: You absolutely want to join the optional Jewish walking tour here. I was mesmerized as our guide led us down Synagogue Street, pointing out the archaeological remains of an ancient Synagogue and an old mikveh (Jewish bath). 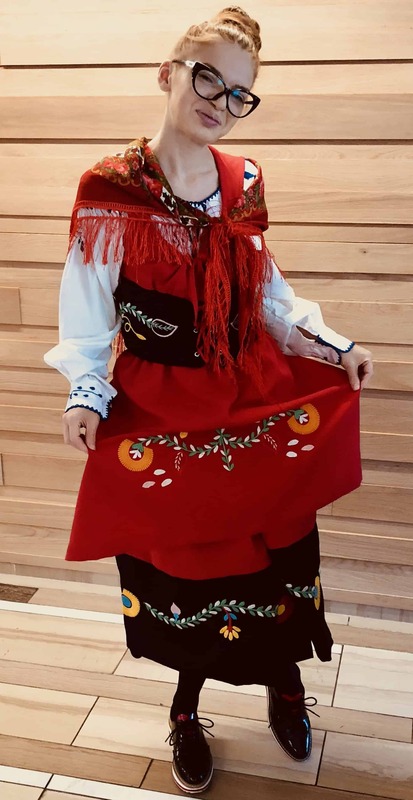 She shared with us the amazing history of Sousa Mendes, the Portuguese consul in Bordeaux, who, like Schindler, risked his life to save thousands of Jews during the Holocaust, yet has remained relatively unknown. When we passed a doorway with some ancient writing carved into the stone she told us that locals had always thought it was Arabic until recently when a Jewish scholar on a Viking Cruise told them that it was actually cursive Hebrew and translated it as Old Testament Psalm 34:23 “The Lord is the redeemer of the souls of his servants, and none are condemned who take refuge in him”. 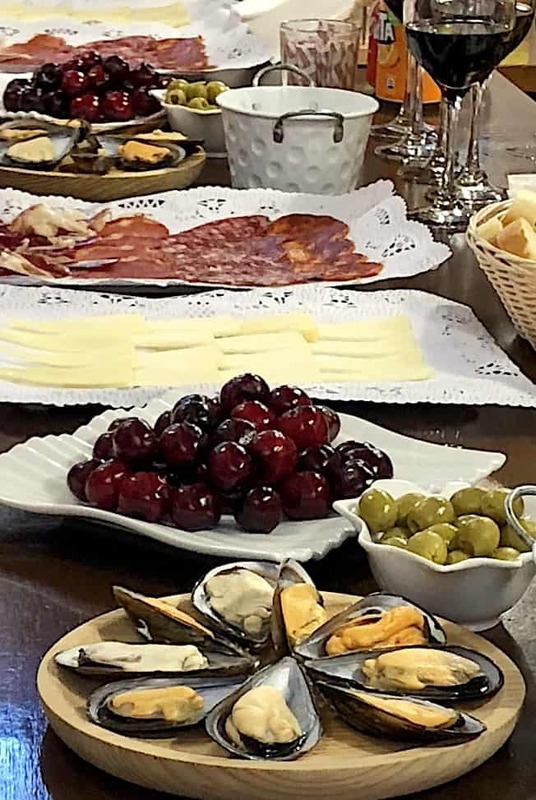 The perfect start for our day in Spain was a generous charcuterie tasting at the Salamanca Central Market, where I have to admit, I really pigged out on the piggy, partic the Jamón Ibérico, Spain’s renowned cured ham. Then we were let loose at the bustling Plaza Mayor, free to wander the streets of “the golden city” of Salamanca, so named because of its honey-colored sandstone buildings. My recommended sights are the New and Old Cathedrals-both are uniquely impressive, chat up some of the students at the 13th century university, the oldest in Spain, and don’t miss the Museum of Art Nouveau for their extraordinary collection of creepy-cool dolls, brilliant blue stained-glass Deco ceiling and a Lalique exhibit which includes the most exquisite Rolls Royce hood ornament. 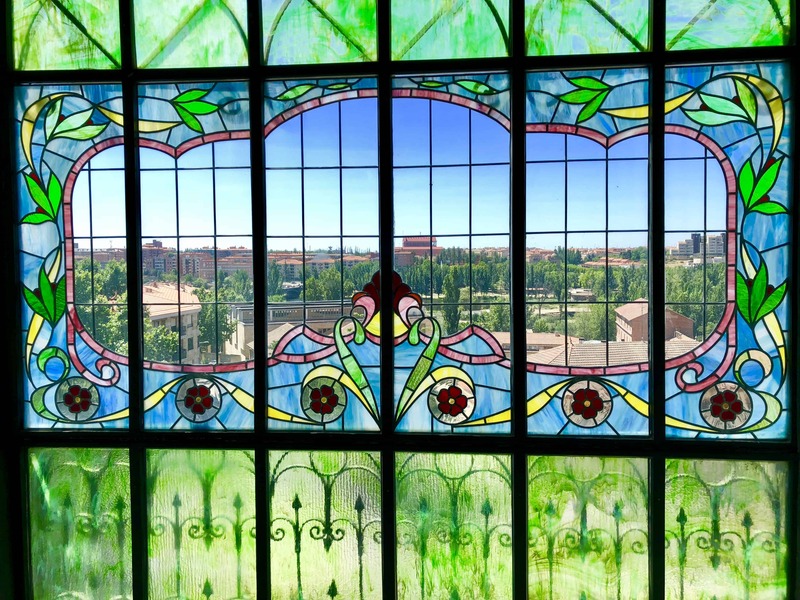 Then head to Viandas de Salamanca for the best bocadillos (finest quality Iberian ham on a French baguette) followed by dessert at Chocolateria Valor where you should order fresh crispy churros to dunk in a cup of their rich hot chocolate. *Secret tip: Note that this is your longest bus ride-approximately 2 ½ hours each way…but it was so worth it! Make sure you’ve downloaded an interesting book and shhhh- don’t tell Viking, but I “borrowed” a pillow from my cabin and enjoyed the loveliest nap during the drive back. Everyone else was so jealous! Pinhao- I could happily live on their bread and wine! Our destination was the mountaintop, foodie village of Favaios, known for their unique bread and wine. 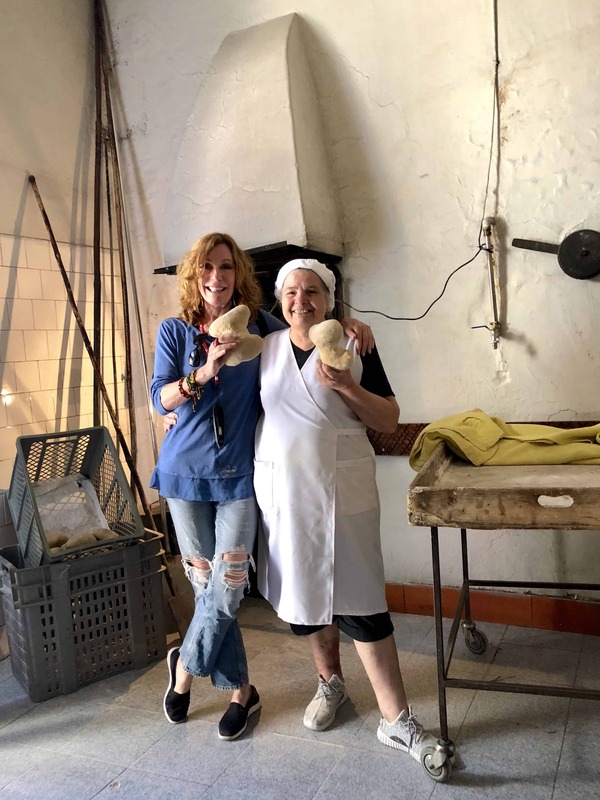 Although there are only 1,000 people living here the village has eight, tiny, family-owned bakeries all producing the same “four-corner bread” which is baked in a stone oven over grapevines the same way it has been for centuries. 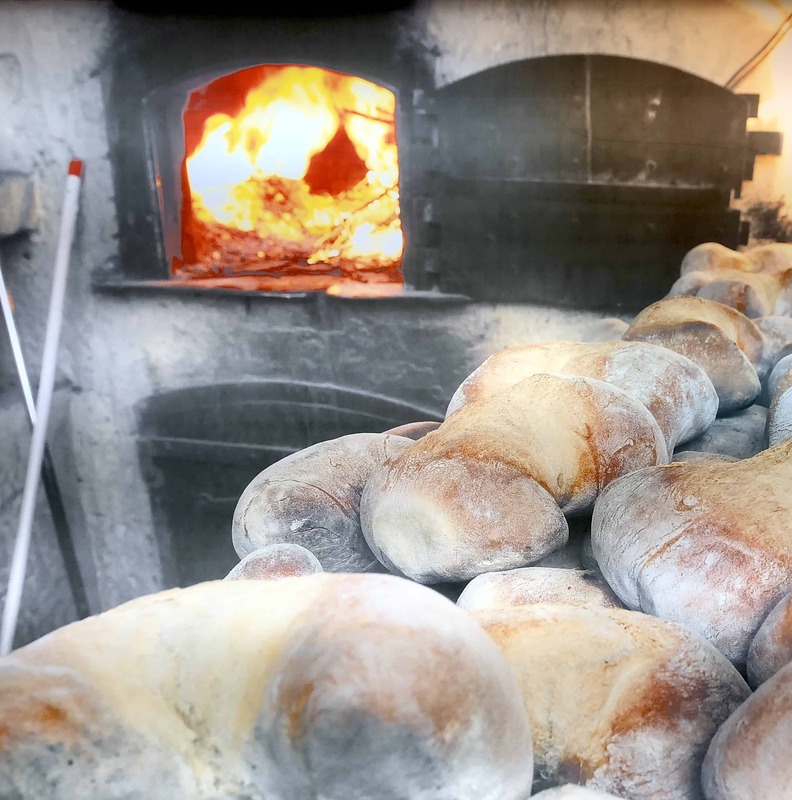 We stepped into one of the bakeries, where we watched the baker knead and form rolls with the precision of a Swiss watchmaker, before tearing into a steaming hot loaf, spread with local preserves accompanied by a shot of wine. Favaios is famous for Muscat wine which is even sweeter than Port. 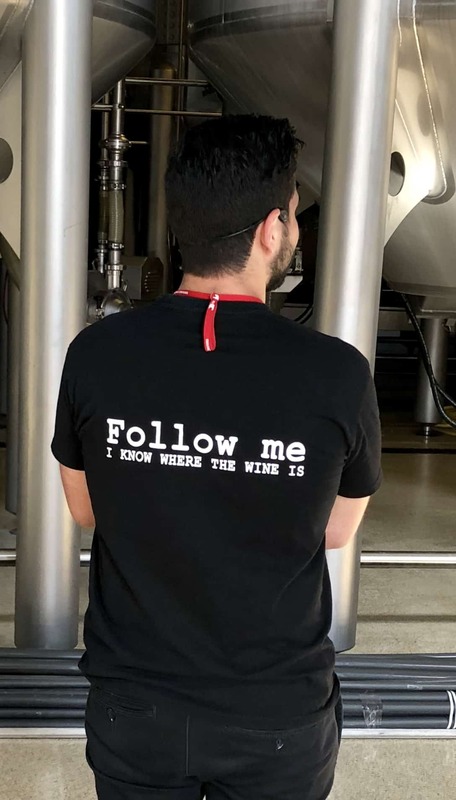 We had an informative tour of the local Moscatel wine cooperative, which produces almost 30 million bottles annually, one of which was awarded a Gold medal for the Best Wine in the World! A visit to the aptly named Bread and Wine Museum answered our remaining questions. 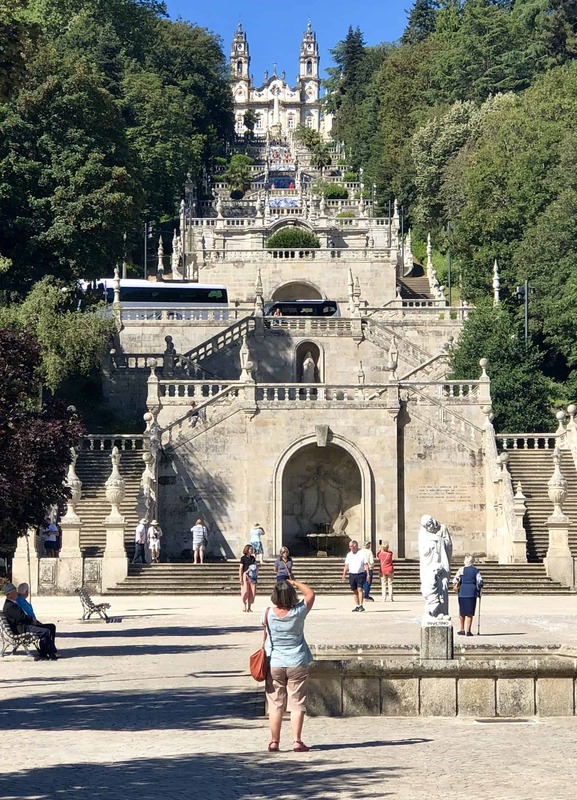 After all the quaint towns and villages it took a minute to adjust to the bustling city of Lamego, where we visited the Santuario de Nossa Senhora dos Remedios (Shrine of Our Lady of Remedies) built in 1791. Thankfully, we were dropped off at the top of the baroque staircase liberally decorated with beautiful azulejo tiles, urns, and statues, where we were given the choice to walk down the 686 steps to the town center. 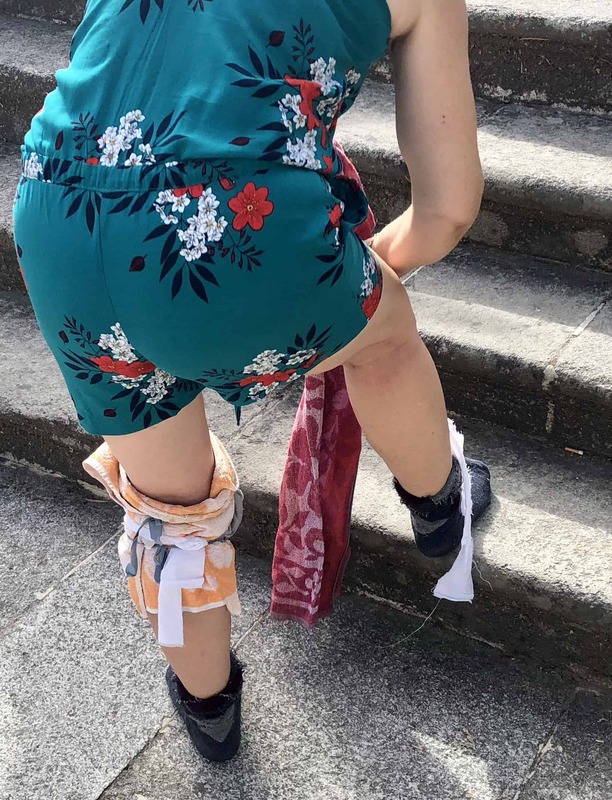 When I enquired as to why a lady was wrapping her knees in layers of fabric I was told that devote followers traditionally climb UP these stairs on their knees in hopes of getting pregnant! I opted instead to sample a glass of Raposeira (sparkling wine) at an outdoor café.